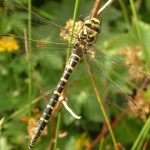 Herefordshire supports 25 of the 40 or so species of dragonfly recorded in the UK. 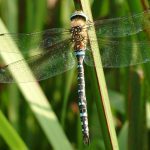 There are 5 species which are very rare and 10 which are very common within the county. 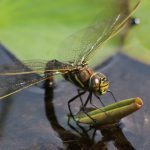 Some species lives by running water and other besides ponds. 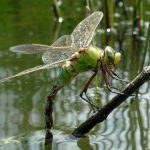 Features of good dragonfly habitat include unpolluted water, sun, shelter, emergent and floating vegetation and muddy edges. 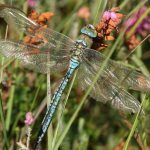 The following species account was prepared by Mike Williams of the Farming & Wildlife Advisory Group following a talk by Peter Garner, former dragonfly recorder for the county. Flies from mid-May onwards. 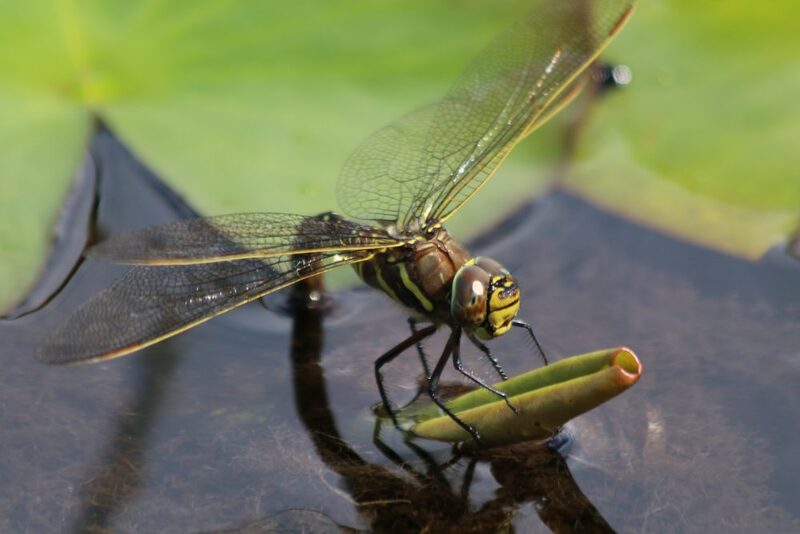 Very common in all types of ponds, even very small ones. Male gunmetal blue, female yellow/bronze. 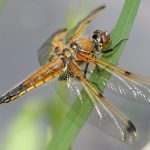 Can be confused with female Broad-Bodied Chaser but it is smaller. Four spots on wings. Only seen on 12 ponds in Herefordshire and only known to breed on 3. Breeds by large rivers, never in ponds. Only found on about 12 rivers in the UK, the Wye, Severn and Avon are its stronghold. It has also been recorded on the Lower Teme and the River Lugg near Hereford. It is common on the Wye south of Hereford. Flies May – June. Sits on vegetation and easy to see when vegetation is disturbed. After emergence commonly disperses several miles from the river. 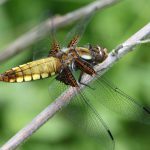 The largest dragonfly in the UK. Common on big garden ponds, it is blue with a black line down its back. 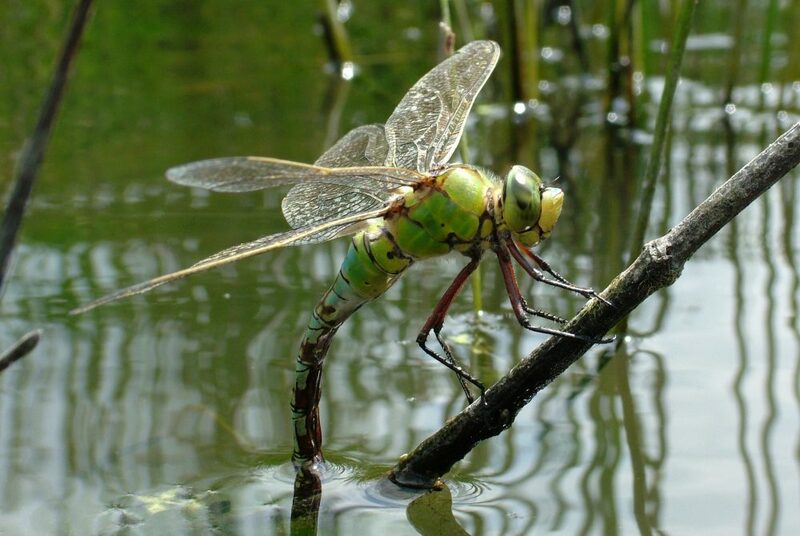 Patrols a pond incessantly, flying 1 to 1½ metres above the water. Found in about 60% of all ponds. Climate change has led it to spread its range to include Herefordshire in recent years. Flies 5cm above the water. Needs a pond with a bare bank, gravel pits or mud at the edge of the pond. Recent colonist. 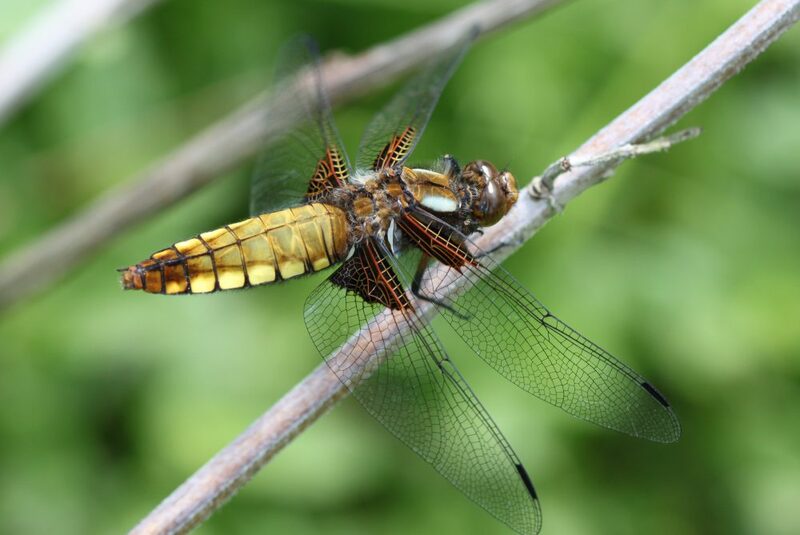 Male/female coloured similarly to the Broad-Bodied Chaser. 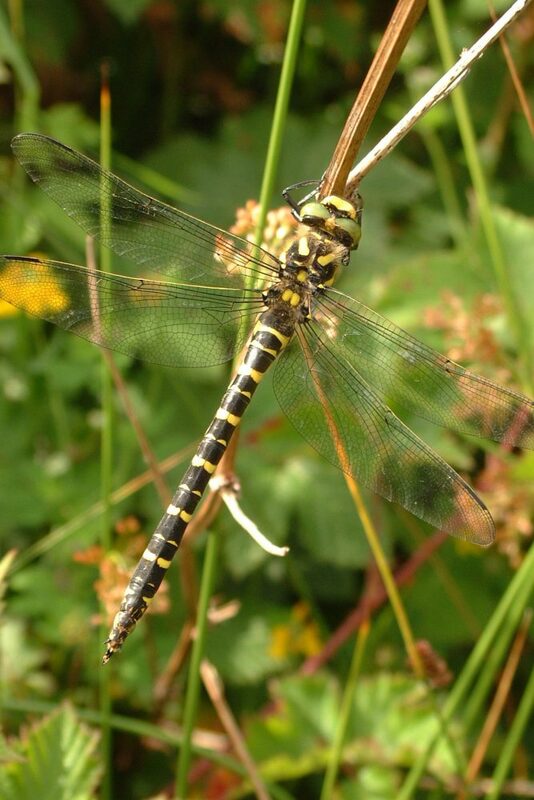 Common in Cornwall and Pembrokeshire. Likes stony streams. 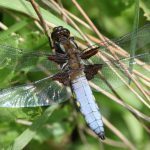 Only common in Herefordshire in the Olchon Valley, also occasionally seen in Brilley and Cusop, and near the Forest of Dean. Flies from late July to October. Uses ponds as small as a metre across. Patrols less than an Emperor and does not have the black line of the Emperor down its back. Emperors are gone by the end of August. Wanders away from ponds more than the Emperor. Curious of humans, will come up to you and hover, then fly off. It may repeat this behaviour. 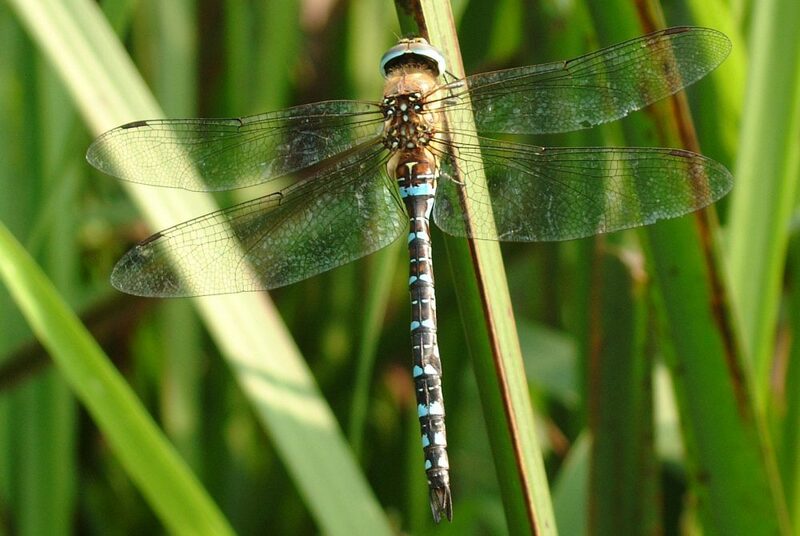 Clear end blue segments on the tail are the defining feature of the male. It has a perch that it returns to regularly to eat its food. Flies from mid-August onwards.  There are about 25 known breeding sites in Herefordshire. Until recently it was only a migrant in the county. 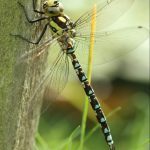 Almost a centimetre shorter than the Southern Hawker and more than a centimetre shorter than the Emperor, and with more black on it. The tail is not pure blue. Very rare in Herefordshire. Found only on 2 sites. Probably breeding near High Vinnals. 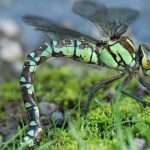 Similar in size to the Southern Hawker. Cannot be confused with any other species. 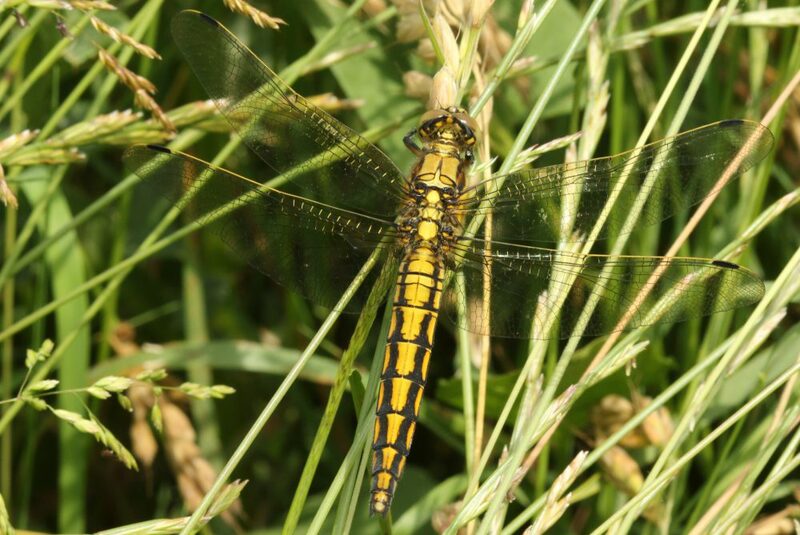 Only found in the east of Herefordshire, particularly around Upper Sapey, Mathon and Whitboume. 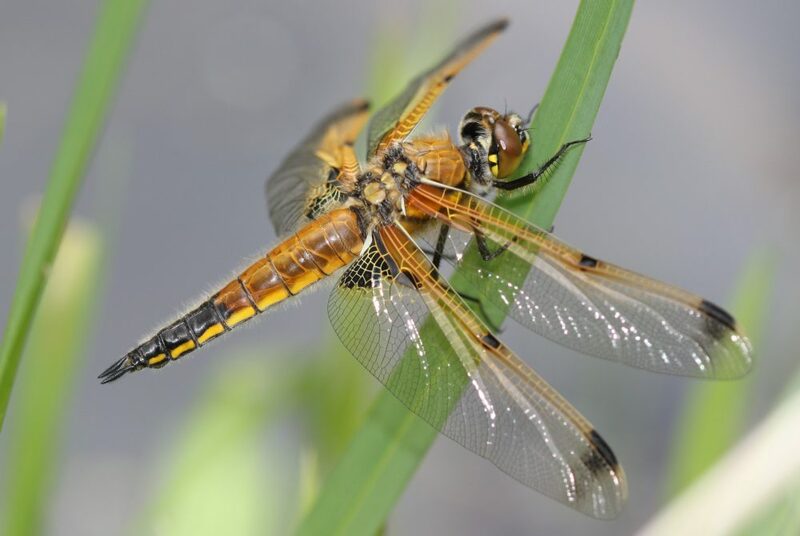 Large and brown, brown wings, it is slightly smaller than the Emperor. Flies from the end of July onwards. 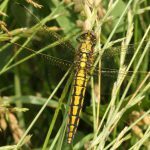 Commonest dragonfly in the county. It is possible to see 100 at once on a good-sized pond. First seen in Herefordshire in 1987. 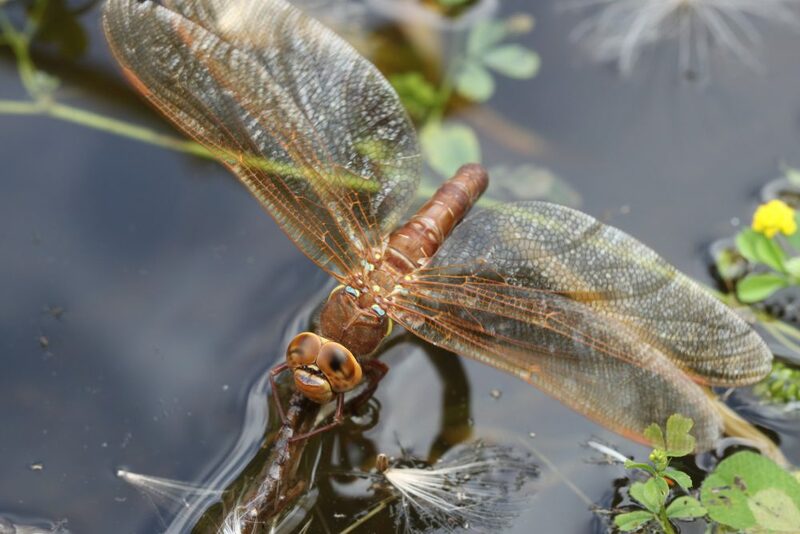 It is different from the Common Darter, being a brighter red and having black legs. Found commonly in good numbers on slower flowing rivers, e.g. the Arrow below Pembridge, the lower Lugg and the Wye. Found on faster flowing rivers and small streams, e.g. the Arrow above Pembridge. 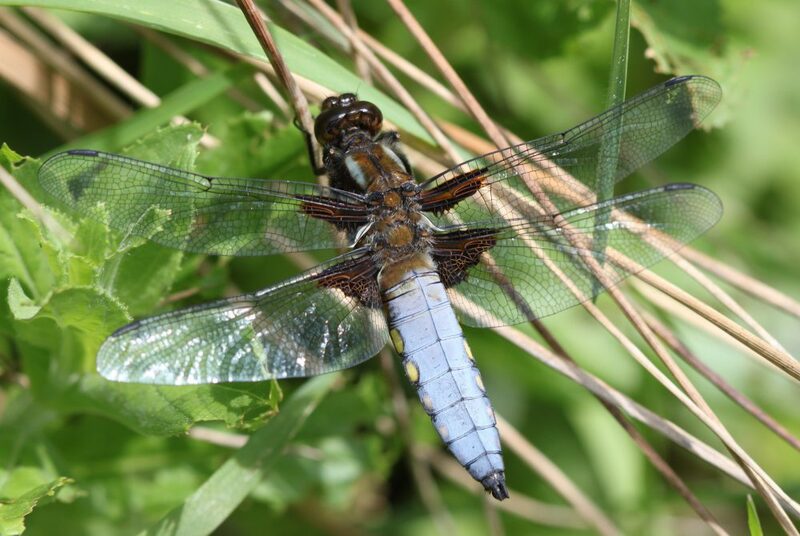 The wings of the male appear brown or blue depending on which way the light falls on them. 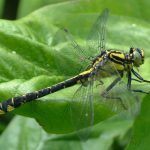 First damselfly to appear, usually in late April early May. 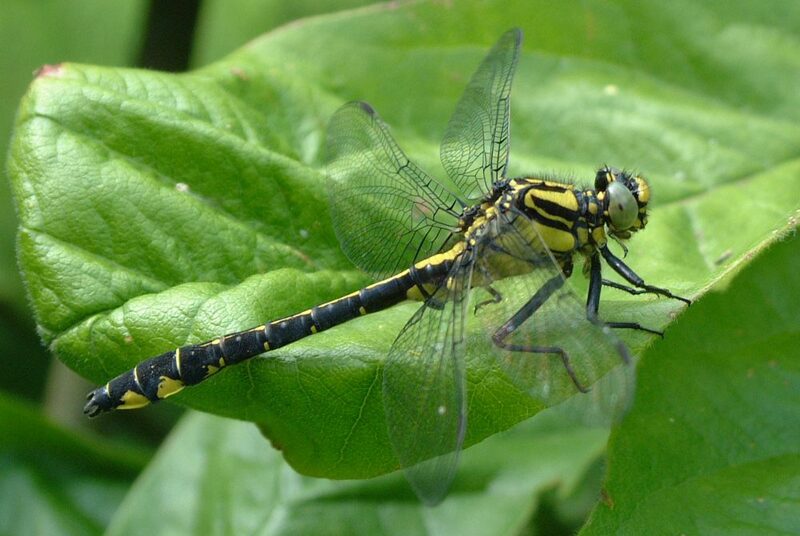 Hides in vegetation, especially nettles, Appears in smaller numbers than the blue damselflies. Very common in west Herefordshire, rarer in the east of the county. It is not very conspicuous and the male has a blue tail. The female hides like a stalk in vegetation near the river. Found by rivers including the Wye, Lugg, Arrow and Monnow, Can be very common beside the Wye, which is one of the best sites in the UK. Has very blue eyes. 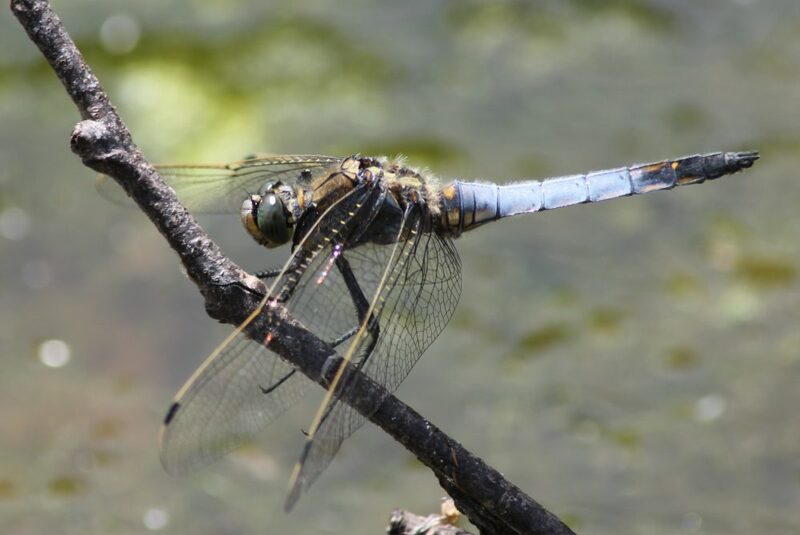 Will tolerate mildly polluted ponds, Thorax varies greatly in colour between blue, pink, bronze and violet, but all have a blue tail on the penultimate segment of an otherwise black abdomen. 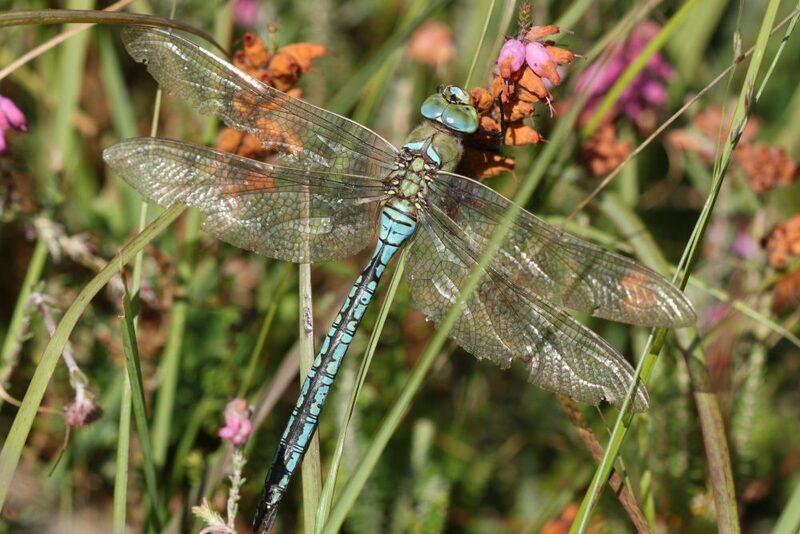 A nationally rare species, its only site in Herefordshire is a gravel pit. It is Britain’s smallest damselfly. Needs shallow water that does not freeze. 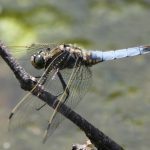 Less blue on the end of the tail, marking it as different from the blue-tailed damsel fly. 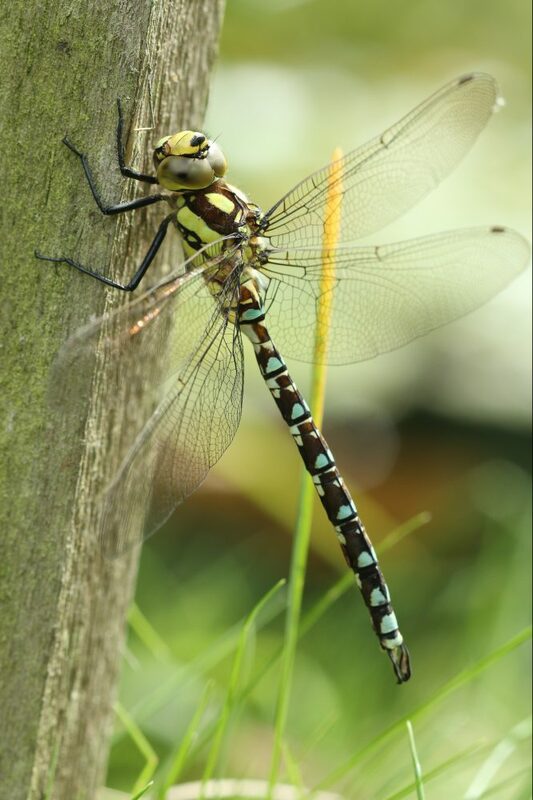 About 10 ponds host this blue damselfly with conspicuously red eyes – likes floating vegetation to bask on especially water-lilies. Very common and many found in most ponds. Very similar to the Common Blue Damselfly. Very common and many found in most ponds. Very similar to the Azure Damselfly. 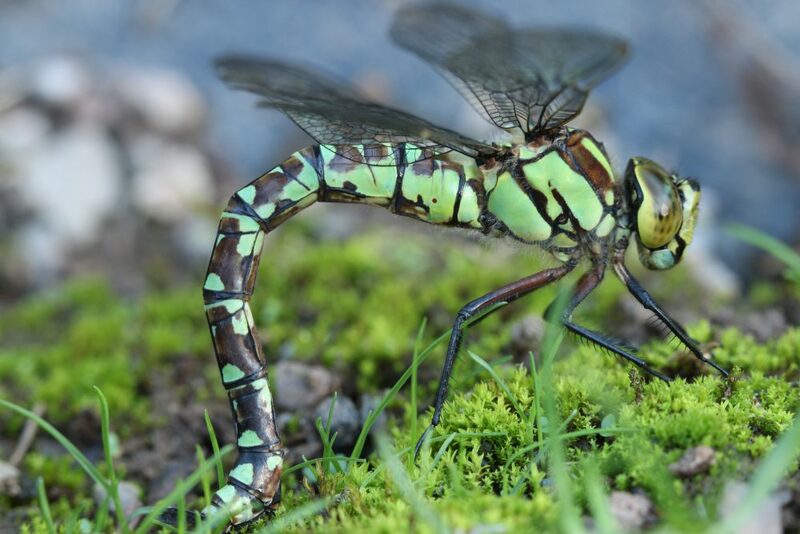 “The Dragonflies of Herefordshire” by Peter Garner. View on Amazon. 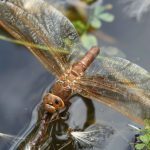 An excellent book for dragonfly identification is “The Field Guide to the Dragonflies and Damselflies of Great Britain and Ireland” by Brooks and Lewington. View on Amazon.